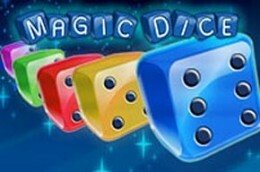 Magic Dice is a 5-reels and 5 paylines video slot powered by Playtech software provider. As you already can guess from its name, this traditional and classic game has a magic inspired theme with related symbols such as tricks, illusionists, objects and magic techniques. Magic Dice does not offer wilds or free spins features. The main symbols are: white dove, white rabbit, sleeves, pockets, magic boxes, white gloves, black hat, magic wand and, of course, the magic dice.